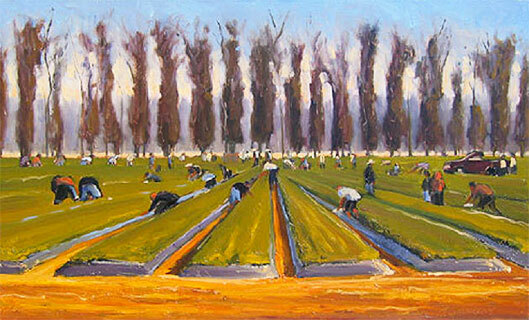 SANTA ANA, Calif. – A selection of paintings by Laguna Beach artist Mark Jacobucci will be on display through January 30, 2012 in the Thomas F. Riley Terminal as part of John Wayne Airport’s Community Focus Space Program. His artwork can be seen on the departure (upper) level near the security screening areas and on the arrival (lower) level near baggage carousels 1 and 4. Jacobucci’s paintings are primarily landscapes: beaches, coastlines and rural scenes. “Often I try to see and paint the beauty in an ordinary everyday scene, such as an alleyway or a street intersection,” said Jacobucci. The JWA exhibition will feature seven oil paintings depicting playing, working and driving around in Orange County. Known for using vibrant colors, large brushstrokes and plein air methods, Jacobucci gives a contemporary flair to his paintings. He studied painting in high school on Cape Cod, Massachusetts, attended Brandeis University for his Bachelors of Arts Degree and the University of Massachusetts, Amherst, earning a Master’s of Liberal Arts Degree (MLA). After receiving his MLA in Landscape Architecture in 1984, Jacobucci came to California the following year to work in the profession at an internationally acclaimed design firm in Laguna Beach. He continued to paint and sketch and took painting classes at the Laguna College of Art. Jacobucci’s work is displayed in various exhibitions including the Festival of Arts in Laguna Beach since 2001, and is held by numerous private collectors and corporations. Corporate collectors include: The Hyatt Hotels, Irvine Company, Irvine Apartment Communities, Peralta Partners, McDermott Will & Emery, Transtar, Corrigan Law, Coffee Architects, Broadcom, and Union Bank. To learn more about JWA’s Community Focus Space Program, visit www.ocair.com/terminal/art. Update your subscriptions, modify your password or e-mail address, or stop subscriptions at any time on the User Profile Page. If you have any questions or problems with the subscription service, e-mail support@govdelivery.com for assistance. Inquiries specific to John Wayne Airport should be directed to jwedge@ocair.com. This service is provided to you at no charge by the County of Orange, California. Visit the County of Orange on the web at www.ocgov.com and John Wayne Airport (SNA) at http://www.ocair.com.